Sometimes the simplest recipes, with only a few ingredients, are the best. The flavors are clear and uncluttered. This is one of those recipes. It may appear to be too simple to entice you, but give it a try and then draw your conclusions. It's low cal and very easy to prepare. The coconut milk gives this dish a Thai flavor, but no Thai chilies are used , so it's not a spicy dish. Don't omit the "crunchies" -- they're an important part. 1 medium size butternut squash. Cut the whole butternut squash in half lengthwise. Scoop out the seeds and place (cut side down) on a flat baking dish lined with aluminum foil (for easy clean up). Roast the squash in a 375� oven for about one hour. Remove when soft and let cool. Peel and cut into chunks. Heat one 14 oz. can of Thai coconut milk in a saucepan, being careful not to scorch the bottom of the pan or let the milk "bubble up". 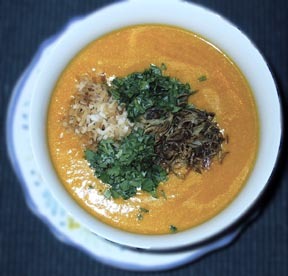 In a blender, puree the warm coconut milk and roasted butternut squash in batches . Remove each batch to a large bowl. Place in a deep saucepan and bring to hot when ready to serve. Slice about 3 -4 shallots very thinly. Set the thin slices out to dry on a paper towel for about 1 - 2 hours (optional). Watch for burning edges and move the shallots frequently to get even browning. Toss a handful of shredded coconut (sweetened or unsweetened are both OK in this recipe) on a baking sheet and bake in a 350� oven for about 10 minutes. WATCH CAREFULLY. The coconut can easily burn. Stir it frequently. Remove from the oven when lightly brown. It will brown more after it is removed from the oven. Store in an airtight container when cool. It will keep for one week or more. Wash a handful of fresh cilantro (also known as coriander or Chinese parsley). Remove leaves from stem and discard stems. Chop leaves and set aside. Place all of these ingredients in a bottle and shake well to blend. Pour over mixed greens and toss well. Place the hot soup in a deep bowl and top with 2 TBS. each of the "crunchies". Pass more "crunchies" in small bowls for second helpings.